Material: Sides and top made from high quality silver-grey Oxford nylon fabric, Bottom and ends made from hard-wearing rubber coated nylon, Interior insulation lining of aluminum coated polyester, Sturdy zips for easy fitment. Suits Dometic Waeco CFX-75DZ Fridge. Very happy with my buy. It’s my second one in 14 years. Will recommend to anyone. Duel zone is a breeze. I can’t believe how cheap my complete purchase was and the best off all the quick delivery. Got my product in 3 days time. Good job to MyGenarator. "Fridge works fantastic as a fridge alone or as a fridge/freezer." Excellent unit, seems to use very little power, as stated in the specs. It has been very well made and seems to be quite robust. The Dometic Fridge came with a Dometic Ice Box which holds ice well, not the 6 days quoted but still a good ice box. We are very pleased with both units. Great to deal with, everything went smoothly. Fridge arrived 2 days ahead of scheduled date. The service was great and the short time my fridge took to get to me was the perfect all round experience. "Great product, fast delivery, excellent price"
Excellent fridge/freezer, love the fact you can only have one compartment running at one time if you need, and that the compressor shuts off when the compartment are at temperature to save the compressor running. Great size and is easy to move around with nice sturdy handles. Have been looking around for a quality fridge at a great price then found my generator which provided the cheapest price with free delivery and even adding the insulation cover i saved more money. And all arrived within a week of placing the order. Being in a remote town in Western Australia. Where things usually take 2 or 3 weeks or longer to have this arrive in less than a week was perfect and all at a great price. Easily $500 less than what most places charge for this good quality fridge. Currently FREE With the Dometic Waeco CFX75DZW is a Thunder Portable Bluetooth Speaker (RRP $138)! The Thunder Portable Bluetooth Speaker is a water resistant wireless speaker that can be paired to create a true stereo sound. 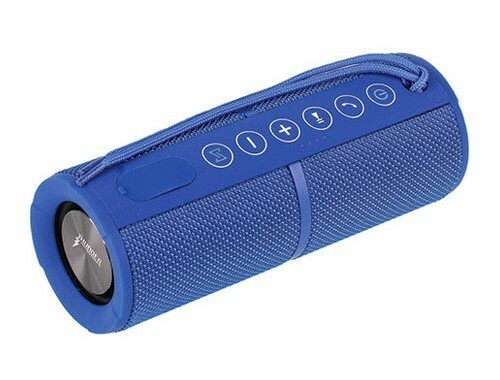 Whether your camping off grid or having a BBQ with freinds, this little Bluetooth speaker will keep the entertainment rolling all day and night. Click on the image above or click here for more information. The new Dometic Waeco CFX75 litre Dual Zone portable fridge-freezer. If you want to store fresh food and bottled drinks this fridge and freezer will satisfy all your needs. The Dometic Waeco CFX 75DZW with its two temperature zones makes simultaneous cooling and freezing possible. This high-tech compressor fridge and freezer is impressively efficient, quiet and built to withstand the most demanding of loads; yet is also remarkably lightweight and easy to transport. Separate compartments for cooling and freezing down to –22 °C. You can even change settings via an app! The Dometic CoolFreeze CFX has some seriously impressive features. Firstly, there’s the CFX Special Electronics which include an intelligent automatic turbo cooler and memory function. Then not only is it suitable for deep freezing down to –22 °C but it can also operate on solar power. Plus, regardless of the outside temperature, this cooler will provide a first class, superbly quiet cooling performance. You can take this amazing cooler and freezer wherever you go! Fitted with heavy-duty details like reinforced corners, stainless steel hinges and a robust lid lining, the hi tech coolers in the CFX series can withstand the most demanding of loads. The CFX models give you the convenient option of controlling and monitoring the cooling temperature by WiFi app. This 75 litre dual zone model has quickly become a favourite option with families on caravan / camper trailer / 4WD holidays. Two separate compartments for cooling and freezing in any combination desired to be ste - fridge/fridge, fridge/freezer, freezer/freezer. Fridge / fridge, fridge / freezer, freezer / fridge, or freezer / freezer. Detachable and reversible lids, interior lights with lid open alarm, USB port, 4 point M6 nutserts in base, WiFi enabled, spring-loaded handles. Good quality fridge. Drain holes in compartments make cleaning easy. Would be better if baskets inside were smaller or different size to allow lifting a small basket to get to bottom basket. Pleasant and easy experience. Postage was fast. Previously purchased a rubbish fridge/ freezer, then I finally woke up to myself and realised Waeco is the way to go. CFX 75 DZW is a ripper, works very, very well and drains a lot less power than previous fridge. I have it in our campertrailer , but sometimes use as a beer fridge for BBQs. Had a little hick up with delivery as there were 2 people with the same surname in the same suburb purchasing the same product at the same time. My Generator sorted it out quick smart and had the goods delivered to me promptly. We've used the CFX75DZW on two short breaks with our camper trailer and are extremely happy with the purchase. The fact that either side can be a fridge or a freezer, or both, makes the unit so versatile. The baskets inside the fridge are useful for compartmentalizing foods and drinks and the WiFi app is very handy. When we're at home we turn off one zone and use 240V to power the other zone as a drinks fridge. Bought this 75ltr waeco fridge/freezer for my camper trailer, and it exceeds my expectations, can take heaps of food and in summer/ hot days can eat ice cream while others can’t. Love the app to monitor/change temperature settings and if temp goes up it lets you know. I love how versatile this product is being a fridge /freezer, Fridge/fridge or freezer/freezer. I can keep an eye on the temperature on my smart phone and use the USB ports for charging. The staff at My Generator are very helpful and quick to answer any questions that you may have. The postage was fast and over all I wonderful experience shopping with them. Value for money, top quality product! The cfx75w is a amazing fridge and has great features I highly recommend it to anyone looking to get a new fridge. Great to deal with. Great prices and awsome bonuses when buying fridges super fast delivery. Will be buying from here again. This is an excellent Fridge Freezer product is very flexible as either compartment can be a fridge or freezer. Quality of the build is first class and it fits into the back of my Pajero perfectly. Great additions to the deal such as a 6 can cooler / heater. Used it in both modes and it worked brilliantly. Stand for the fridge also very useful when not in the car. Q:If I used this in a campervan enclosure, how much space does it require around it? Thank you. Hi Clare, we would recommend a buffering around the perimeter of the fridge of at least 100mm when storing inside an enclosure. Many portable fridge manufacturer's will actually recommend up to around 200mm of buffering gap specifically around the fridge's vents for optimal performance. Q:Looking at a Dual Zone fridge-freezer for my camper. 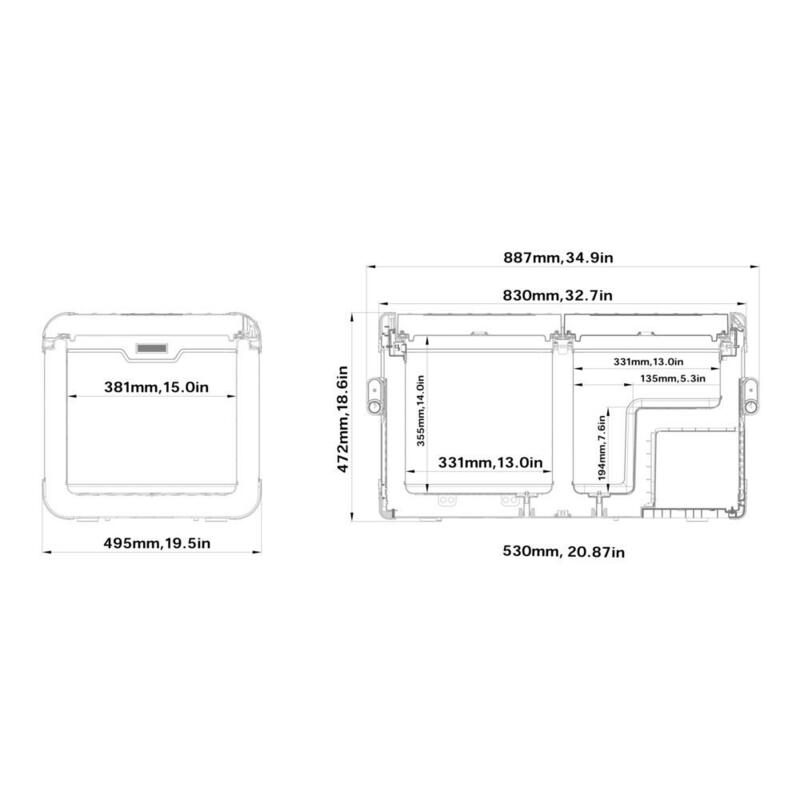 How much power draw difference (on 12 Volt) is there between the Dometic CFX 75 and CFX 95 Litre models? If you were to run both compartments as just a fridge (approx. +5°C), then your power draw would be less; around 1 Amp/Hr for the CFX75 and around 1.25 Amp/Hr for the CFX95. Obviously if you were running both compartments as a freezer, then the power draw would be greater. Hope this helps - again please note that average power consumption data depends on things such as ambient temp, compressor speed (fridge setting), temp of contents in fridge, how often lids are opened etc.